2015 Suzuki SX4 S-Cross 1.6 DDIS ALLGRIP TCSS review | What Car? It's no secret that small SUVs are selling extremely well in the UK, but look into the figures more closely and it's diesel automatics that are generating a significant chunk of the income. Suzuki was arguably the originator of this class back in the 1980s and 1990s, and its most recent efforts, the SX4 S-Cross and Vitara, have been strong contenders. 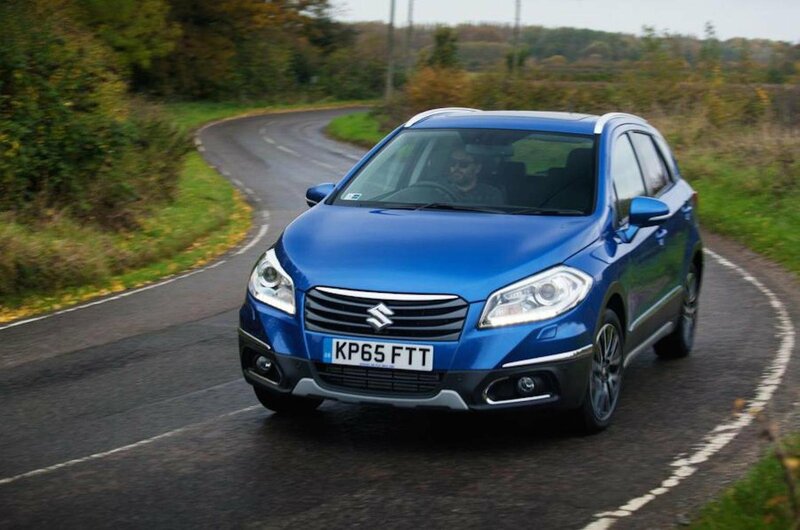 To broaden the SX4's appeal and take advantage of those sales, Suzuki is now offering it with a six-speed dual-clutch automatic gearbox, which is available exclusively with the Suzuki's 118bhp 1.6-litre diesel engine. In fact, it's even more exclusive than that, because the only trim choice with the new auto 'box is range-topping SZ5 with all-wheel drive. Previously, only the 1.6 petrol got a CVT automatic option. That specification puts this model's price at £25,149, making it the most expensive S-Cross you can currently buy, commanding as it does a £1350 premium over an SZ5 diesel manual. At least there's a lot of equipment thrown in: sat-nav, DAB, Bluetooth, a USB socket, 17in alloy wheels, a rear parking camera, climate and cruise control as well as automatic xenon headlights and auto wipers are among the luxuries. What is the Suzuki SX4 S-Cross 1.6 DDIS ALLGRIP TCSS like to drive? Let's start with the engine, which for a modest 118bhp 1.6 diesel feels more potent than its numbers suggest. Sure, it causes the front wheels to scrabble around for traction a touch on wet roads, but importantly it has more than enough pull from around 1500rpm to ensure you needn't to work it hard in order to build speed. Official figures suggest 62.8mpg is possible, and we were pleasantly surprised by the 48mpg we managed on our mixed test route. Beyond that, though, things are pretty disappointing. The new gearbox is fine at a gentle town cruise but starts to become slow to react if you ask anything more from it. Even taking to the wheel-mounted paddles for manual changes doesn't bring about much more urgency to the gear shifts. Engine refinement is best in town, too, where the revs are lowest. Left to its own devices the gearbox hangs on to gears a little too long in the SX4's standard Auto driving mode, allowing too much grumbling engine noise into the cabin. Switch to Sport mode and the gearbox holds on to ratios even longer, exposing the 1.6's noise and vibration even more. Sport mode also quickens throttle response, but the S-Cross isn't a sporting SUV by any means. The way it controls its body in turns is impressive, but the steering, while precise enough, feels vague off centre and feels unnatural in the way it quickly builds weight. It also has a noticeably aggressive self-centring action. Turning the mode selector left activates Snow mode, and it's possible to electronically lock four-wheel drive, rather than only have the rear wheels help out when the front wheels start to slip. Whichever mode you're in there are good grip levels for everyday driving, although the front wheels will eventually start to run wide if pushed hard. On its 17in standard alloy wheels the SZ5 S-Cross struggles to remain composed over even slightly potholed road surfaces, too. It's worst at low speeds, improving over high-frequency bumps at a faster cruise, but there's always too much suspension thump heard and felt in the cabin. At least wind and road noise are better contained. What is the Suzuki SX4 S-Cross 1.6 DDIS ALLGRIP TCSS like inside? The same as the rest of the SX4 range, which is to say it's a mixed bag. Two adults will be fine for space in the front seats and the driver gets a good range of driving seat and steering wheel adjustment. Some might find the driving position is quite high, but this helps take advantage of the SX4's decent visibility in all directions, helped rearwards in the SZ5 by its standard rear camera. The rear of the SX4's cabin has always posed more of a problem. Even without a panoramic sunroof fitted, average-size adults will struggle for head room, but with the SZ5's standard panoramic roof in place head room is even more restricted. The same adults will find their knees brush against the front seatbacks, but the space is more generous in this respect. Boot space is more positive, with 430 litres on offer with the rear seats fixed in place. Happily the SX4's rear seats split in a 60/40 configuration and fold almost flat to open the space out to 875 litres. It's a practical space, too, staying nice and square in shape with a cubby on either side, bag hooks and underfloor storage. Acess is also very good, and there's only a small lip to lift bags over. Despite this being the most expensive model in the range, there's no lift in cabin quality, which means the same largely cheap-feeling dashboard with the odd softer surface dotted about. At least everything feels tightly screwed together and the switchgear is largely well damped. Suzuki's touchscreen infotainment system looks a little aftermarket and has some illogical menus but is sharp and nicely responsive to touch. When the SX4 S-Cross first hit our roads in 2013 it was worthy of four stars in the trims that made the most sense, but as time has moved and the class has evolved, the range is now worthy of three. Unfortunately, this particular version of the S-Cross isn't worth quite that. Keeping the S-Cross as cheap as possible has been the key, because it's well equipped across the board, so going for this expensive model just isn't necessary. Add the fact that this engine and gearbox don't work well together and that the SZ5's large wheels hurt ride comfort and it really isn't particularly recommendable. Stick with our pick of the range, the two-wheel-drive 1.6 diesel with a manual gearbox and in SZ4 trim and you'll be saving money on purchase price and running costs while still benefitting from lots of equipment. Or, even better, test drive Suzuki's newer Vitara for even cheaper prices and better rear space.